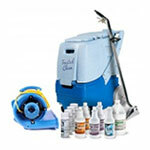 This is the most comprehensive carpet & upholstery cleaning package in the industry! It is even one of the most comprehensive carpet cleaning packages that we have to offer because of all the chemicals that come with it. A mobile auto detailing machine is included in this package, and it comes with an external heater that helps to break the bonds of deeply embedded dirt from your carpet fibers. The powerful 3-stage vacuum motor then works quickly to quickly that dirt and water from your carpet. You can also remove the heater and use the machine as a non-heated machine if you just want to use a cold water extraction method. We also include an upholstery tool, besides the standard detail tool that comes with the machine, as well as a FREE crevice tool, for cleaning those hard to reach areas. There are 4 cases of chemicals included in this automotive cleaning package. One is an assorted package that will remove stains, clean, leave your upholstery smelling fresh, and protect your extraction machine. The second case can be used a pre-spotter to attack, clean, and remove those really heavily stained areas, like floor mats. The third and fourth cases are simple spot and stain removes that will remove stains like grease, pet stains, and food or beverage stains. We also included a pump-up sprayer so you can pre-spray these areas, then extract with the detailer. We always recommend doing a rinse afterwards to ensure all chemicals are removed from the carpet or upholstery.